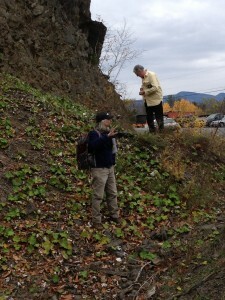 On November 1, 2014 a group of archaeologists and geologists participated in a workshop on chert at the New York State Museum, and then left in a caravan of cars, trucks and vans for a field trip to chert-bearing sites located in Greene and Ulster Counties. This is the second of a projected annual series of field trips in eastern New York that promises to provide archaeological and geological colleagues with a firmer basis and common language for discussing chert. Chert is one of the most fundamental materials used in ancient Native American technology in this region. These programs are produced through the collaboration of New York State Museum geologist Charles Ver Straeten, New York State Museum archaeologists Jonathan Lothrop and Christina Rieth, and Binghamton University Public Archaeology Facility archaeologist Laurie Miroff. The morning program featured table-top displays of chert from eastern New York and northern New England, as well as presentations on the Munsungun Lake and Mount Jasper quarry locations in Maine and New Hampshire. The presentations were made by University of Southern Maine geologist Stephen Pollock with significant additional information and discussion by University of Southern Maine archaeologist Nathan Hamilton, Chuck Ver Straeten, and geology/geoarchaeology consultant Philip LaPorta. The afternoon portion of the program was designed and led by Chuck Ver Straeten. It led to locations near the Village of Catskill in Greene County and the City of Kingston in Ulster County where a combination of different exposures provided the opportunity to see Helderberg, Esopus, and Onondaga chert-bearing rock formations in place. Chuck Ver Straeten provided the guide to stratigraphic order and the origin of these formations and their cherts. Chuck also inspired the participants with a sense of what still needs to be learned with regard to these eastern New York Devonian cherts. This program was immensely useful to the participants, not to mention a lot of fun on a crisp November day when the late afternoon rain was very light, and yielded little in the way of stinging sleet. Rarely does a group of adults become so engaged in the pleasure of a Saturday outing, except perhaps at an amusement park (but bedrock exposures have a way of becoming amusement parks for geologists and archaeologists). Speaking as just one archaeologist, I want to give at least a hint of why I find the subject of chert sources fascinating (and why I will continue to have fun with it long after the field trip). 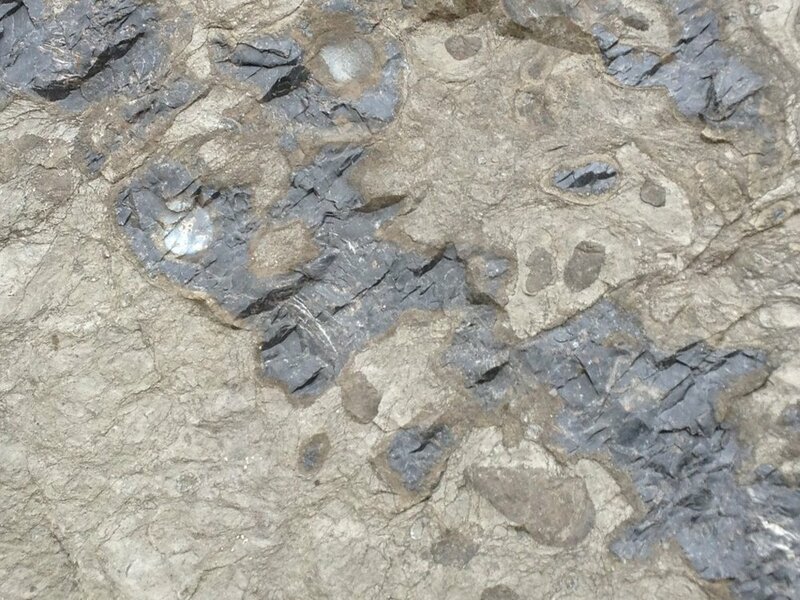 Eastern New York State is rich in chert sources, including the Ordovician Normanskill chert as well as the subjects of November 1’s field trip, the Devonian cherts of the Helderberg, Esopus and Onondaga formations. 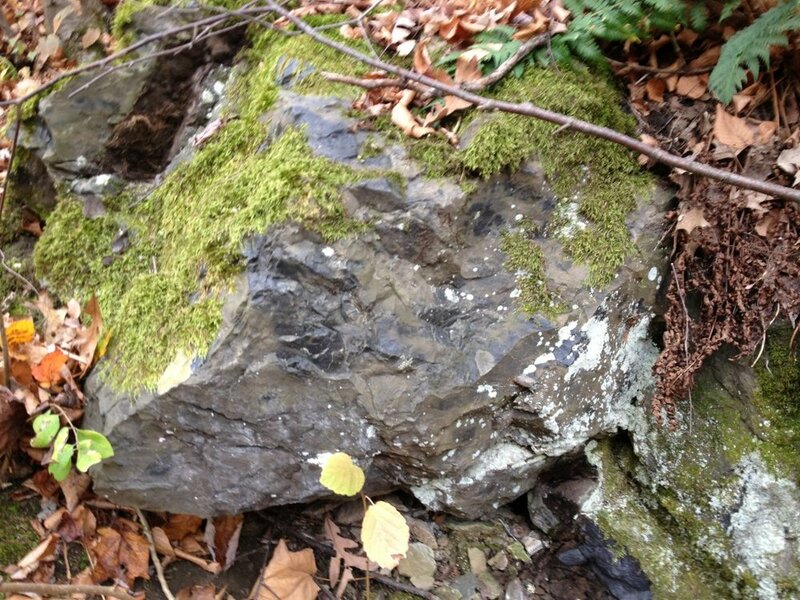 Often a relatively short trip of a mile or two (quite less in certain places) will provide access to several, or perhaps all of the chert varieties contained in these rocks. At the same time, however, it is not unusual for archaeologists in this region to find evidence of archaeological sites or ancient activity locations dominated by the occurrence of one chert type in preference to others. And these preferences often differ at adjoining sites. As an archaeologist, I need to ask why this happens, because access as a function of distance doesn’t seem to apply in these cases. I need to consider whether this is a matter of ancient knowledge (i.e., were only limited sources of chert known to the inhabitants of the site? ); habitual practices adopted by the site’s inhabitants; or larger traditions of practice that provided a broader and more enduring set of rules that largely excluded some chert varieties from selection for tool stone. The quality of the stone may be a factor, but if so, it must operate in a complex way, because although archaeologists may feel that these stones vary in quality, a wide range of stone types was used, at least over the long period of eastern New York prehistory. I may have more to say about this in future blog posts as my colleagues Kerry Nelson, Meadow Coldon and I examine the strength of evidence for the spatial differentiation of the use of stones such as Esopus and Onodaga chert at the site we are studying in Cobleskill, New York; and Normanskill and Kalkberg or other Helderberg cherts at a series of sites in Coxsackie, New York. 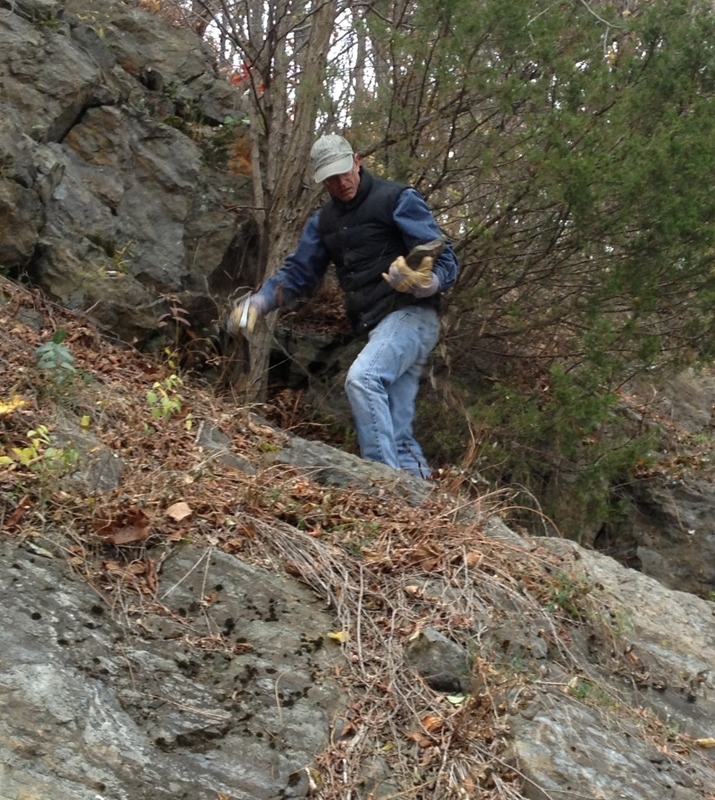 A similar or different sense of ancient Native American choices in stone selection may emerge from work we have been doing in the Town of Malta, Saratoga County, New York. We shall see. The thought I want to leave with was stated succinctly by Chuck Ver Straeten at the end of the field trip. What geologists and archaeologists are doing with the chert workshops and field trips is useful. We are still finding out how useful, but the chert workshops are already enhancing our ability to communicate and envision future research that depends on better understandings of chert.